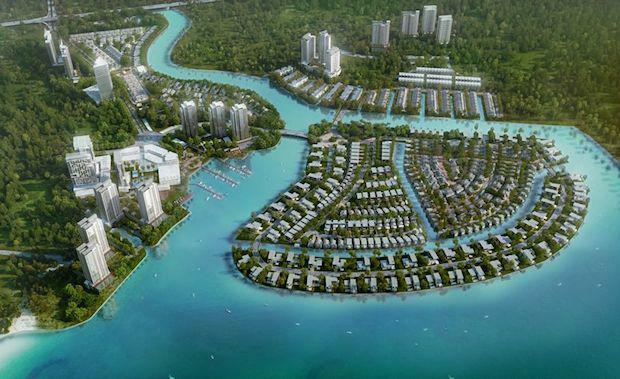 The man behind the Gold Coast's Sanctuary Cove and Hope Island is forging ahead with the $5 billion Senibong Cove project in Malaysia's southern-most state, Johor. Billionaire property developer Lang Walker's 89 hectare, 12,000 lot integrated waterfront community will be the largest project his Malaysian-based company Front Concept has undertaken, with $100m already spent on the waterfront estate's initial infrastructure including canals, a marina, landscaping and boardwalks, as well as reclamation works to create an island. Senibong Cove is accessible from both Johor and Singapore's city centres and is nearby to state-of-the-art highways and transport. Lang Walker described his latest project to The Australian as "exciting. ""I can talk for hours about [it],” he said. Sales for the development have totalled $330 million since plans were unveiled in 2010 – the first 250 dwellings on lower levels sold out by the end of 2012. Neighbouring Singaporeans have snapped up properties – they make up 80% of buyers – taking advantage of First Concept's competitive market price. According to The Australian, the former prawn farms and swampland were also on Chinese competitors Country Garden and Greenland's radar – they were among an influx of developers to rush in on the prime real estate in 2005 and are now proposing similar waterfront residences to Senibong Cove. The ambitious project is set to be completed in 2022, with construction one-third finished and due to include a 15,000sq m retail precinct, as well as a yacht club and marina.